Edwin Aldrin joined him and offered a simple but powerful description of the lunar surface: “Magnificent desolation.” They explored the surface for two and a half hours, collecting samples and taking photographs. 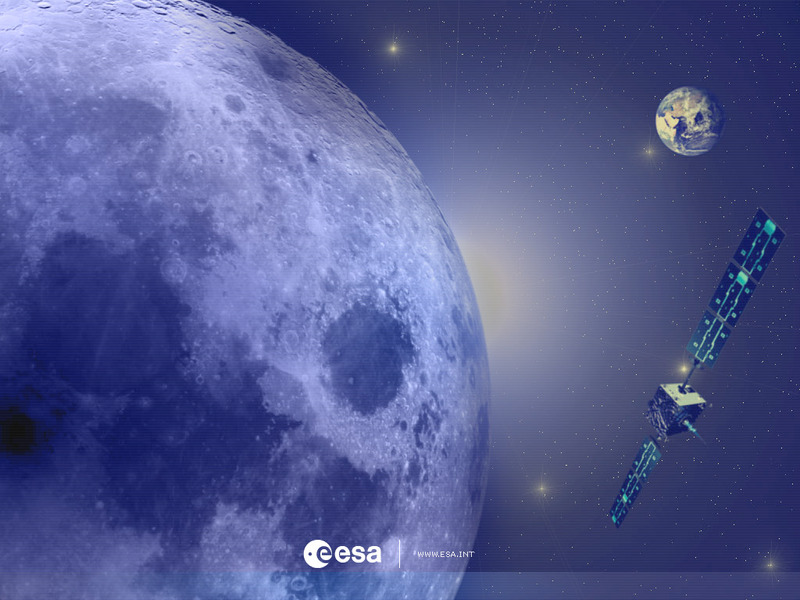 Now a European spacecraft is flying to the Moon, slowly but steadily, using revolutionary propulsion techniques and carrying a battery of miniaturised instruments to continue the lunar exploration started many years ago. Over 30 years after the last Apollo mission visited the Moon in 1972, there is still much that we do not know about our nearest satellite. For example, how was it created? What role did it play in the formation and evolution of Earth? ESA’s SMART-1 may help to answer these questions. As well as testing new technology, SMART-1 will make the first comprehensive inventory of key chemical elements in the lunar surface. It will also investigate the theory that the Moon was formed following the violent collision of a smaller planet with Earth, four and a half thousand million years ago. But the main purpose of the SMART-1 mission is to flight-test the new solar-electric propulsion technology (or ‘ion engine’) – a kind of solar-powered thruster that is ten times more efficient than the usual chemical systems employed when travelling in space. If all goes well, such a system could be providing the propulsion system for future ESA missions into deep space. However, in the process, the mission will be providing some fascinating science. For example, SMART-1 will be mapping the lunar surface chemical composition more accurately than ever before. SMART-1 will be leading the way in the latest imaging techniques. Images taken from many different angles and X-ray and infrared detection work will allow scientists to draw up new three-dimensional models of the Moon’s surface. SMART-1 will be looking at the darker parts of the Moon's south pole for the first time. It will be mapping the so-called Peak of Eternal Light, an eerie mountain top that is permanently bathed in sunlight, while all around are dark craters never touched by the Sun. These craters are believed to harbour water-ice in the lunar soil. SMART-1 will also help scientists to confirm if ice is present at the lunar poles, where the temperature never rises above –170°C. Any water on the lunar surface would be very helpful in the creation of permanent bases on the Moon.